At Phones Review we inform readers about the latest smartphones and tablets but as well as this we like to give our readers news of accessories such as cases, docks etc. Today we have some news of an iPhone 5 accessory that is something quite different and it’s called the My Bunjee. You’ve guessed right, it does have connections to a bunjee jump! We’ve recently given you details of the iPhone 5 Dock+, a Kickstarter project that would be a useful accessory and earlier today gave info on some new iPhone 5 Urban Armor Gear cases. However the My Bunjee is pretty unique and as well as that it’s affordable and would make a great gift for the upcoming holiday season, a perfect stocking filler for iPhone 5 owners. It would be particularly useful for iPhone 5 users who are a bit careless with their device, say you have a knack of dropping it or knocking it off tables, as with the My Bunjee if you drop your phone it will bounce right back up to you. 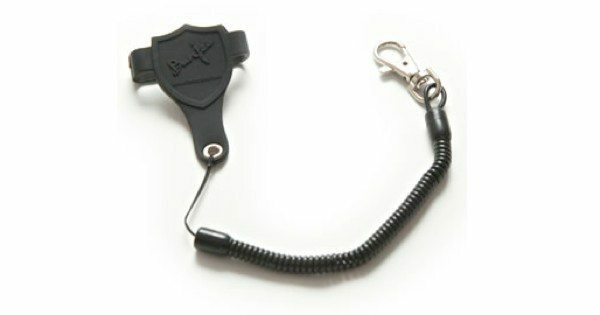 The My Bunjee fits securely over one end of your iPhone and then the other end of the plastic cord attaches to a belt buckle or bag zip making it very hard to lose your phone. The cord is stretchy so that your phone will be easier to find in the bottom of a deep bag and it’s also strong making it easier to keep your phone secure. The My Bunjee is only Â£5.95 and it’s available from Prezzy Box here. There’s also a My Bunjee Beaded version at Â£6.95 and a My Bunjee Lanyard version at Â£4.95. We think this is a really neat accessory that many iPhone 5 owners would be happy to receive.